To Cite: Jagadish Kumar K, Krishna Kumar H C, Kadabasal Basavaraja C, Kumar R. Junctional Rhythm in a Child with Dengue Shock Syndrome, Arch Clin Infect Dis. 2017 ; 12(4):e66205. doi: 10.5812/archcid.66205. Introduction: Dengue infection has become a serious health problem. It is endemic in most countries of the South-East Asian region. In hyperendemic regions, DHF is more common in children less than 15 years of age. There have been increasing reports of DF and DHF with atypical manifestations (Expanded dengue syndrome). The spectrum of cardiac involvement varies from conduction rhythm disturbances to myocarditis causing hypotension. Case Presentation: Arrhythmias are the first and early indicator of myocarditis. We report an 11-year-old girl who developed Junctional rhythm associated with dengue shock syndrome (DSS) from Mysore, India. Timely ECG will help the clinician detect cardiac involvement. Conclusions: Even though cardiac involvement is rare in dengue fever, arrhythmias do occur. They are essential to diagnose, as they are the first signs of acute myocarditis. Arrhythmias with dengue shock may pose difficulties in the fluid management and use of inotropes. Simple ECG will help the clinician diagnose and monitor arrhythmias. Dengue infection has become a serious public health problem with dramatic increases in the frequency of the disease (1). Around 500000 DHF (dengue hemorrhagic fever) patients require hospitalization each year and approximately 90% of them are children aged less than five years (1). There have been increasing reports of dengue fever (DF) and DHF with unusual atypical manifestations due to the involvement of liver, kidneys, heart or nervous system (Expanded dengue syndrome) (1). The spectrum of cardiac manifestations includes self-limiting arrhythmias to myocarditis causing hypotension and pulmonary edema (1, 2). Various cardiac rhythm disturbances have been reported in dengue infection (2-4). Eventhough cardiac involvement is not uncommon, it can cause significant morbidity and mortality (3). Arrhythmias are the first and early indicators of myocarditis (4, 5). Timely ECG will help the clinician to detect cardiac involvement (4). We report an 11-year-old girl who developed Junctional rhythm associated with dengue shock syndrome (DSS). An 11-year-old girl presented with a history of fever since 12 days ago and a headache and easy fatigability for 1 day to the JSS Hospital pediatric ward, Mysore, India. She also had nasal bleeding and melena. There was no previous history of cardiac disease. On examination, she had flushed skin and conjunctival congestion. Her vitals were temperature 99°F, pulse rate 62/minute, respiratory rate 22/min, BP 94/62 mm of Hg, CFT < 2 seconds, and SpO2 99% at room air. Abdominal examination showed tender hepatomegaly, just palpable spleen, and ascites. Respiratory system examination showed decreased breath sounds in right basal regions. Cardiac and nervous system examinations were normal. At 3 hours of admission, she developed DSS. We noticed Junctional Rhythm at 20 hours after admission (Figure 1). The sequence of events is depicted in Table 1. A, ECG showed Junction Rhythm at a rate of 55 /minute; B, ECG showing Sinus Rhythm with tachycardia after Inj. Dobutamine @ 5 micrograms/kg/minute; C, ECG with Inj. Dobutamine @ 1 microgram/kg/minute with Junctional Rhythm; D, off Inj. dobutamine and IV Fluids. ECG showed sinus rhythm on the 5th day; E, ECG showed sinus rhythm on the 8th day (discharge). 3 hours after admission Developed hypotension, BP-84/68 mmHg, CFT > 4 sec, PR62/min, feeble pulse, cold peripheries, RR-24/min, SpO2-98%. The child was managed with Ringer Lactate according to the WHO Protocol for Dengue Shock Syndrome management. 20 hours to 24 hours of admission PR55/min, BP-94/68 mmHg, RR-22/min, SpO2-100% in room air, CFT < 3 sec, warm peripheries with IV Fluids @ 5 mL/kg/hr. ECG showed Junction Rhythm at a rate of 55 /min (Figure 1A). Echocardiography showed mild mitral and tricuspid regurgitation with a good biventricular function and LV Ejection Fraction of 66%. 25 hours to 36 hours of admission PR-54/min, RR-30/min, SpO2 98%, BP-92/70 mmHg, narrow pulse pressure, peripheries cold (on IV Fluids @ 5 mL/kg/hr), CFT-4 sec. Cardiologist opinion taken and it was inferred that the Junctional Rhythm and bradycardia could be due to Myocarditis. Started on Levosalbutamol nebulization and Inj Atropine iv one dose given. Planned for a temporary pacemaker implantation if the child developed giddiness. With the above clinical picture of normal BP and cold peripheries, we started on Inj. Dobutamine @ 5microgram/kg/min in view to increase the peripheral perfusion. Both the PR and BP picked up to 102 /min and 130/100 mmHg, respectively, with ECG showing Sinus Rhythm with tachycardia (Figure 1B). Hence, Inj. Dobutamine was decreased to 2 mcg/kg/min so as to maintain the HR at around 70 - 90 bpm and BP around 50th centile for the age. 37 hours to 48 hours of admission PR varied between 70 and 100 /min, BP-96/60 mmHg, RR-28/min, SpO2 96%, CFT < 3 sec., warm peripheries on IV Fluids @ 5 mL/kg/hr and Inj. Dobutamine titrated between 1 and 2 mcg/kg/min according to the BP and PR. 49 hours to 72 hours With Inj. Dobutamine @ 1mcg/kg/min, the PR would vary between 70 and 80 /min with Junctional Rhythm (Figure 1C) and with 2 mcg/kg/min, there was tachycardia with sinus rhythm. Hence, it was titrated between 1 and 2 mcg/kg/min. One dose of oral Orciprenaline was given and the PR increased to > 100/min with BP of 118/88 mmHg and hence it was not continued further. 4th day Normal vitals were maintained, general condition improved. Started taking orally well, started tapering IV Fluids and Inj. Dobutamine. HR-82/min, BP-108/72 mmHg, RR-28/min, SpO298% in room air. ECG showed sinus rhythm. 5th day Taking orally well, HR-80/min, RR-24/min, BP-116/80 mmHg, SpO2-100%, CFT < 3 sec. Off Inj. Dobutamine and IV Fluids. ECG showed sinus rhythm (Figure 1D). The child shifted out of PICU. 6th - 8th day The child was monitored in the ward. She was off IV Fluids and inotropes. Normal vitals maintained. ECG showed sinus rhythm (Figure 1E). The child was discharged on the 8th day in a stable condition. Investigations:-Hb 11.3 gr/dL, total leukocyte count-3250 cells/mm3 (neutrophils-63%, lymphocytes-36%, monocytes-1%), platelet count 1.12 lakh/mm3, ESR-50 mm, and Hematocrit-34.5%. Dengue serology showed Negative NS1 Antigen, positive IgM, and positive IgG, suggestive of secondary dengue infection. Her blood Urea was 40 mg/dL, serum creatinine 0.7 mg/dL, sodium 132 mEq/L, Potassium 4.4 mEq/L, Chloride 94 mEq/L, total Calcium 8.4 mg/dL, AST 358 U/L, and ALT 144 U/L. Blood gases showed pH 7.42, PCO2 35.9, PO2 64.4, HCO3 23.2 mEq/L. All these investigations were done in an autoanalyzer. Her blood culture was sterile; Weil-Felix and Widal tests were negative. Sonography revealed ascites, bilateral pleural effusion, and gallbladder wall edema. Echocardiography showed mild mitral and tricuspid regurgitation with good biventricular function (left ventricular ejection fraction of 66%). Her CPK-MB 2.72 ng/mL (Normal = 1 to 7 ng/mL) and Troponin-T 0.014 ng/mL (N = 0.0001 - 0.0249). Her platelet count dropped to 20,000/mm3. She also had bleeding tendencies. Therefore, she was given platelets and fresh frozen plasma. Her platelets started rising on the 4th day. Her ECG revealed sinus rhythm with a heart rate of 120/minute without drugs on the 5th day and discharged on the 8th day (Figure 1). She was followed up for the next 3 months without cardiac complications. Dengue infection is endemic in most countries of the South-East Asian region and now the detection of all four serotypes have made these countries hyperendemic (1). In hyperendemic regions, DHF is more common in children less than 15 years of age (1). There have been increasing reports of DF and DHF with atypical manifestations (1). The spectrum of cardiac involvement varies from conduction rhythm disturbances to myocarditis causing hypotension (2). Cardiac rhythm disturbances like sinus node dysfunction, atrioventricular conduction blocks, atrial fibrillation, ventricular tachycardia, and ectopic ventricular beats have been reported in dengue infection (2-4). In dengue fever, most of the cardiac complications are mild, self-limiting and are underdiagnosed (2). Out of 913 children with DHF, 8% had cardiac complications in a study from Colombia (6). Fluid resuscitation is the mainstay in the management of DSS/DHF; thus, it needs a stable cardiovascular system. Once the volume replacement is adequate, inotropes may be used in profound shock in conditions such as cardiomegaly or in documented poor cardiac contractility (1). Studies have shown that myocardial involvement is more common with shock cases than without shocks in dengue infection (2). Cardiac involvement in dengue infection usually presents as arrhythmias and sinus tachycardia is the most common conduction abnormality (4). Arrhythmias are the first and early indicator of myocarditis (4, 5). It occurs either during acute febrile phase or at DHF/DSS stage, which may or may not be due to direct cardiac involvement (4). However, sinus bradycardia is also a common conduction disturbance seen during defervescence (1, 4). Bradycardia has a potential to precede other arrhythmias like heart block or ventricular premature contraction; therefore we should alert the clinician for intense monitoring (1). Out of 102 dengue children, eleven of them presented with clinical myocarditis. ECG revealed sinus bradycardia in nine and tachycardia in two while seven children showed T-wave inversions (7). La-Orkhun et al. detected cardiac rhythm abnormalities in 29% of children with dengue fever in the convalescent stage by Holter monitoring (8). In our child, Troponin-T 0.014 ng/mL (N = 0.0001 - 0.0249) was elevated and we observed Junctional rhythm (bradycardia) during the critical phase with shock. In fact, during shock, tachycardia occurs as a compensatory mechanism. The child was treated with WHO fluid protocol. Echocardiography revealed left ventricular ejection fraction of 66%. The child had BP of 92/70 mmHg with narrow pulse pressure and cold peripheries. Therefore, dobutamine was started with 5 micrograms/kg/minute. Immediately, unexpected tachycardia appeared and the dose was decreased to 2microgram/kg/min (Figure 1). We titrated the dose of dobutamine between 1 and 2 microgram/kg/min to have the heart rate of 70 - 90/minute along with systolic BP > 90 mmHg. We monitored inferior vena cava collapsibility to avoid fluid overload. Promphan et al. used adrenaline infusion to treat Junctional rhythm with hypotension in dengue fever (9). As our child with DSS had severe thrombocytopenia with Junctional rhythm (bradycardia) but could maintain normal BP with fluids and inotrope support, we did not go for a cardiac pacemaker. Kularatne et al. observed that 23% of dengue patients with electrocardiogram changes (cardiac group) had hypotension and 77% developed tachycardia and bradycardia when compared to 9% in the non-cardiac group (without ECG changes), suggestive of significant cardiac dysfunction (10). The detection of abnormal ECG should be taken as a clue for the diagnosis of myocarditis (3). Therefore, timely ECG will help the clinician to detect cardiac involvement (4). WHO also recommends ECG for dengue patients with profound shock and/or those with complications (1). Elevated Troponin-T and Junctional rhythm with hypotension are specific markers of cardiac involvement. These are the strong points in this report. We did not do continuous Holter monitoring, which is the weak point of this report. The pathophysiological basis for cardiac arrhythmias in dengue is probably attributed to viral myocarditis (4). It may be due to the direct effect of the virus on the myocardial cells or cytokine-mediated immunological response (2). To conclude, even though cardiac involvement is rare in dengue fever, arrhythmias do occur. They are essential to diagnose, as they are the first signs of acute myocarditis. Arrhythmias with dengue shock may pose difficulties in the fluid management and use of inotropes. Simple ECG will help the clinician diagnose and monitor arrhythmias. Authors’ Contribution: All authors were involved in managing the case. Kalenahalli| Jagadish Kumar and Halasahalli Chowdegowda Krishna Kumar collected the data and edited the draft of the manuscript. Chetak Kadabasal Basavaraja and Ravi Kumar involved in collecting the literature and editing the manuscript. Finally, all authors approved the manuscript. 1. Comprehensive Guidelines for Prevention and Control of Dengue and Dengue Haemorrhagic Fever Revised and expanded edition. World Health Organization, Regional Office for South-East Asia; 2011.who. 2. Lee IK, Lee WH, Liu JW, Yang KD. Acute myocarditis in dengue hemorrhagic fever: a case report and review of cardiac complications in dengue-affected patients. Int J Infect Dis. 2010;14(10):e919-22. doi: 10.1016/j.ijid.2010.06.011. [PubMed: 20851651]. 3. Shivanthan MC, Navinan MR, Constantine GR, Rajapakse S. Cardiac involvement in dengue infection. J Infect Dev Ctries. 2015;9(4):338-46. doi: 10.3855/jidc.6200. [PubMed: 25881521]. 4. Navinan MR, Yudhishdran J, Herath S, Liyanage I, Kugadas T, Kumara D, et al. 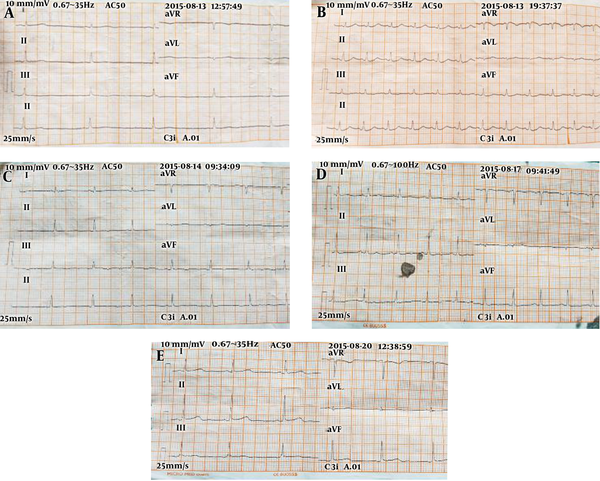 Complete heart block in dengue complicating management of shock due to both bleeding and leakage: a case report. BMC Res Notes. 2015;8:68. doi: 10.1186/s13104-015-1036-9. [PubMed: 25884693]. 5. Nigam AK, Singh O, Agarwal A, Singh AK, Yadav S. Transient 2(nd) Degree Av Block Mobitz Type II: A Rare Finding in Dengue Haemorrhagic Fever. J Clin Diagn Res. 2015;9(5):OD12-3. doi: 10.7860/JCDR/2015/12406.5942. [PubMed: 26155512]. 6. Mendez A, Gonzalez G. [Abnormal clinical manifestations of dengue hemorrhagic fever in children]. Biomedica. 2006;26(1):61-70. [PubMed: 16929904]. 7. Salgado DM, Eltit JM, Mansfield K, Panqueba C, Castro D, Vega MR, et al. Heart and skeletal muscle are targets of dengue virus infection. Pediatr Infect Dis J. 2010;29(3):238-42. doi: 10.1097/INF.0b013e3181bc3c5b. [PubMed: 20032806]. 8. La-Orkhun V, Supachokchaiwattana P, Lertsapcharoen P, Khongphatthanayothin A. Spectrum of cardiac rhythm abnormalities and heart rate variability during the convalescent stage of dengue virus infection: a Holter study. Ann Trop Paediatr. 2011;31(2):123-8. doi: 10.1179/1465328111Y.0000000008. [PubMed: 21575316]. 9. Promphan W, Sopontammarak S, Pruekprasert P, Kajornwattanakul W, Kongpattanayothin A. Dengue myocarditis. Southeast Asian J Trop Med Public Health. 2004;35(3):611-3. [PubMed: 15689075]. 10. Kularatne SA, Pathirage MM, Kumarasiri PV, Gunasena S, Mahindawanse SI. Cardiac complications of a dengue fever outbreak in Sri Lanka, 2005. Trans R Soc Trop Med Hyg. 2007;101(8):804-8. doi: 10.1016/j.trstmh.2007.02.021. [PubMed: 17428513].